for Full-size publicity photo of the composer (right-click and save as... to download). Lucius Richard Weathersby is an assistant professor of music and African World Studies at Dillard University in New Orleans. In this position, he teaches piano and lectures in music theory, humanities and African World Studies. Dr. Weathersby holds degrees from Dillard University in New Orleans (BA in Music and German, 1990), University of Northern Iowa (MM in Organ Performance 1992) and the (Ph.D. in interdisciplinary studies with a specialization in music 2002) from the Union Institute, Cincinnati, OH. He has also studied advanced hymnology and religion at the New Orleans Baptist Theological Seminary. An Advanced study of the German language and culture took place at the Goethe Institute in Rothenburg, Germany. For more than five years, Dr. Weathersby was employed full-time as a director of music in two churches. In each of those positions, he founded and managed concert series- First Congregational Concert Series at First Congregational Church in Waterloo, Iowa and The Second Sunday Concert Series at Church of the Beatitudes in Phoenix, Arizona. These concert series continue to feature local, national and international musical figures. As a concert organist and pianist, each year Dr. Weathersby's concert schedule takes him to Europe, Central America, and many major cities in the United States. As a conductor, he has conducted orchestral and vocal ensembles. While in Iowa as director of music for First Congregational Church, he conducted members of the Waterloo Cedar Falls Symphony. In Phoenix, the sanctuary choir of Church of the Beatitudes performed many classical Masses with members of the Phoenix Symphony. In 1993, he was a guest conductor at the International Dvorak Festival. Dr. Weathersby led The West Union Madrigal Singers in Dvorak's Mass in D. In 1997, he was appointed assistant to Maestro Herriman and the San Marcos Symphony. He is also in demand as a lecturer on such topics as Afro-American Music, Keyboard Techniques, and The Music of the Baroque. Recently, Dr. Weathersby has lectured at Cambridge University, UK, Yale University, The University of London and for The Utah and Southern Nevada Chapters of the American Guild of Organist. As a composer, Dr. Weathersby has written numerous compositions. A few representative works are the following: organ and brass - Fanfare 1993, choir - Seven Last Words, 1994(a thirty minute work on the words of Jesus from the cross), chamber orchestra - Suite in d, 1996(a twenty - five minute work in three movements) premiered by members of the Phoenix Symphony, piano - Tranquillity Suite, organ - Spiritual Fantasy (premiered by the composer on January 19, 1997 at the Meyerson Center of the Performing Arts using the C.B. Fisk Organ; as well as other smaller compositions. Iowa Winter Suite, 1999(a work in four movements for organ) premiered by Mr. Anthony Williams in November of 1999. In this position I am responsible for the overall administration and implementation of programs for the largest academic division which include the following departments: Fine Arts (Music, Theatre, Art), Mass Communications (including speech), World Languages (including Japanese language and culture), and English. Presently in the division of Humanities there are three hundred and fifty majors and fifty-two full-time members of the faculty. In this position I provided administrative leadership for all Humanities events, policies and procedures. Assistant Professor of Music, Chairperson of the Music Department, Founder and Co-director of the Dillard University String Ensemble, also the Founder of the Jessie Covington Dent Chamber Music Festival. This concert series features local, national and international concert artists. I directed a music program that consists of three vocal choirs, two handbell choirs and varies instrumental groups. Topic: Fugues of J.S. Bach. This concert series features local, national, and international concert and performing artists. In this position, I played the organ, conducted three vocal choirs, two handbell choirs. I taught English to Japanese students. While at the University of Northern Iowa, I was a graduate assistant as well as a recipient of the Vice Presidential Scholarship for service to the School and community. 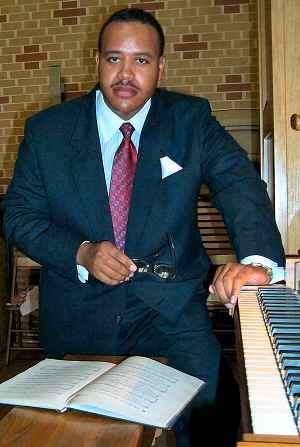 February 9, 2003 Lecture recital on African and African-American organ music The University of Northern Iowa. April 25, 2003 Lecture recital for the Midwestern regional of NANM at the University of Northern Iowa. July 6, 2003 Organ recital at Chiesa di Fossalta di Portogruaro in Italy. July 1 - 5, 2002 Guest Lecturer and Recitalist for the National Convention of the American Guild of Organist, Philadelphia, PA.
August 2 - 5, 2001 Organ Concert and lectures Churchill College, University of Cambridge, England as apart of the Composition in Africa and the Diaspora: An International Symposium and Festival. October 15, 2000 Piano and flute with Wendy Hymes, Baldwin Piano Rededication recital/Jessie Covington Dent Chamber Music Festival, Lawless Memorial Chapel. November 15 2000 Lecture/Recital to the New Orleans Music Club; Topic: African American Composers for the Organ. An Essay on the Origins of African American Music The Aporetic World Cultural Magazine February 2000. Iowa Winter Suite premiered by Anthony Williams. Woodwind Quintet entitled: Three African Portraits, premiered during the ICMAD Festival in St. Louis Mo., March 2001. I have been commissioned by Ensemble Noir of Toronto, Canada to compose a work for brass trio. The premiere will be February 24, 2003. I have been commissioned to compose a work for Pipe Organ, Talking Drum and Orchestra by Mr. Don Walsh of St. Louis Mo. 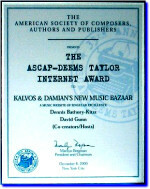 This work will be premiered in March 2003, New Orleans.